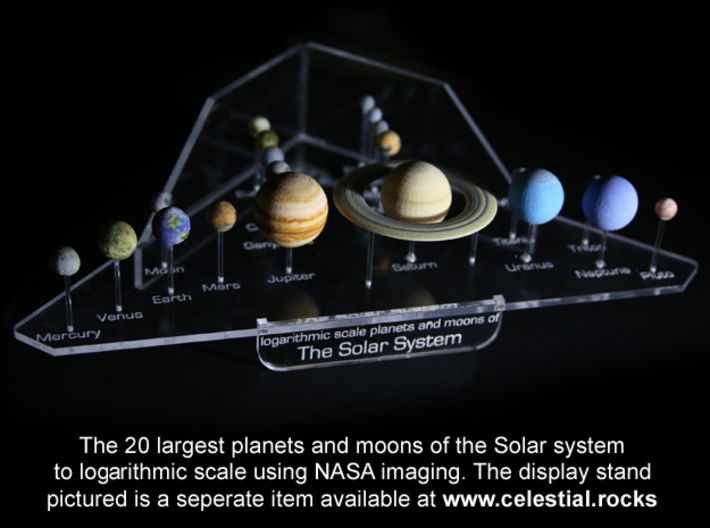 A detailed full color model of each of the planets, gas giants, and major moons of the Solar system, to (logarithmic) scale. 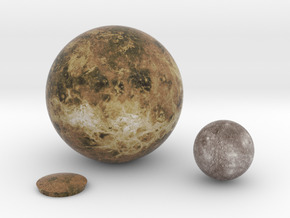 This set includes the 20 largest objects in the solar system (bar the sun). All surfaces are reproduced from NASA imaging. NEW: Updated to include the latest Pluto surface data from the New Horizons probe! 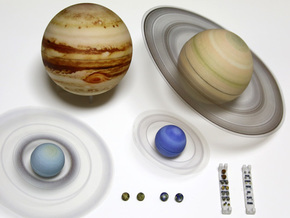 For size reference, Jupiter is 25mm (1 inch) diameter, and Earth is 12.76mm (1/2 inch) diameter. 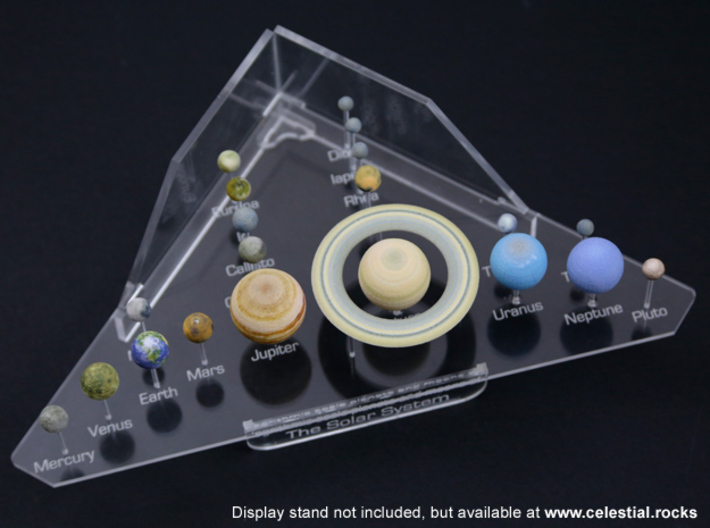 The display stand (pictured but not included) is 238mm wide (9 3/8 inches). 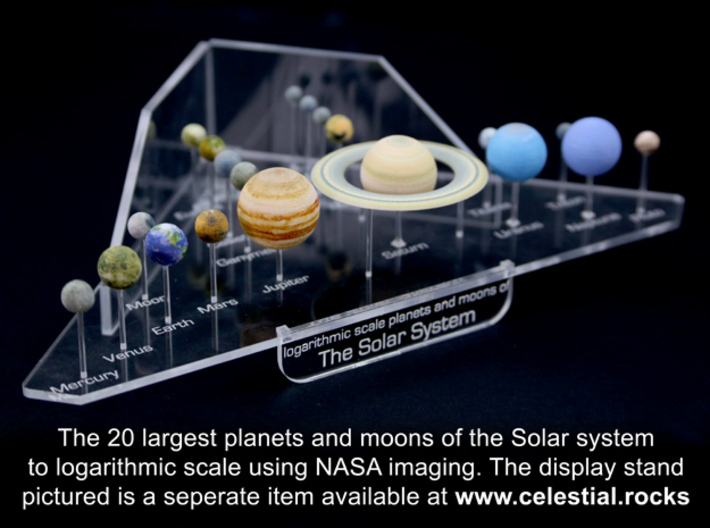 This set is designed for use in orrery or other models of the solar system, and so to best present all planets while preserving scale, the scale has been compressed - a logarithmic scale instead of a linear scale. 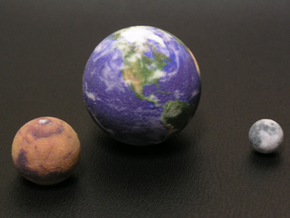 This means that if the model of a moon of Jupiter is larger than the model of Mercury but smaller than Mars, then you know that the real moon really is larger than Mercury and smaller than Mars, But the size diference is compressed - Jupiter, which is really more than ten times Earth's diameter, becomes only twice Earth's diameter, etc. This logarithmic scale allows all planets to be clearly visible together, while at the same time still indicating their sizes relative to each other. What color is a planet - is it color of its surface materials, or the colour of its atmosphere from space, or the color of the surface being colored by the atmosphere filtering light from the sun? The appearance in this set attempts to be that of the surface with moderate atmospheric influence, (with the gas giants depicted as the atmosphere and surface being the same thing). For example, this means that Venus depicts the features of its surface, but they are tinted somewhat by its atmosphere. Similarly, Earth and Titan show ground features, but some areas are tinted and obscured by atmosphere. *Due to hard limitations of the Shapeways production, these minor moons are sharing the same surface map. 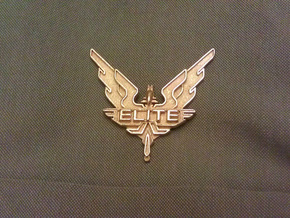 They were chosen because they have a similar surface, and/or their surface is largely unknown. This model creates challenges for Shapeways to produce (lots of tiny loose parts that make it difficult to ensure nothing gets mixed up when multiple prints are in the same batch, especially because software places them differently each time), so I recommend checking your order when it arrives, just to make sure it's satisfactory.